I have Tier One Pricing for those who have a specific budget in mind for the number of images; time spent, and professional retouching. I also offer Tier Two Pricing for those who prefer a full service experience such as; wardrobe consultation, hair & makeup by a professional hair and makeup artist, several outfit changes, custom backdrops, video of your session, custom leather albums & portfolios. It is an experience like no other where you are pampered for the day. Professional hair and makeup, a custom 3 to 4 hour session, up to 5 wardrobe changes, matted prints and upgraded products. along with a print release. Events such as Wedding, birthdays, showers and quinceneras are priced by the hour and are not intended to be portraits. Instead it is documenting an event and pricing is based on the hours of coverage throughout the event. Videos and USB of the files are included. ​Custom photo albums are available upon request. 6,000 square feet for $500. To order additional prints and products from your session. Full payment is required before the order is sent to the printer and vendor. Pricing and turnaround time are subject to change based on the characteristics of your photo shoot. All prints and products are generated from a professional ​print vendor to ensure quality and color accuracy. Applicable sales tax will be added to all print orders and products. 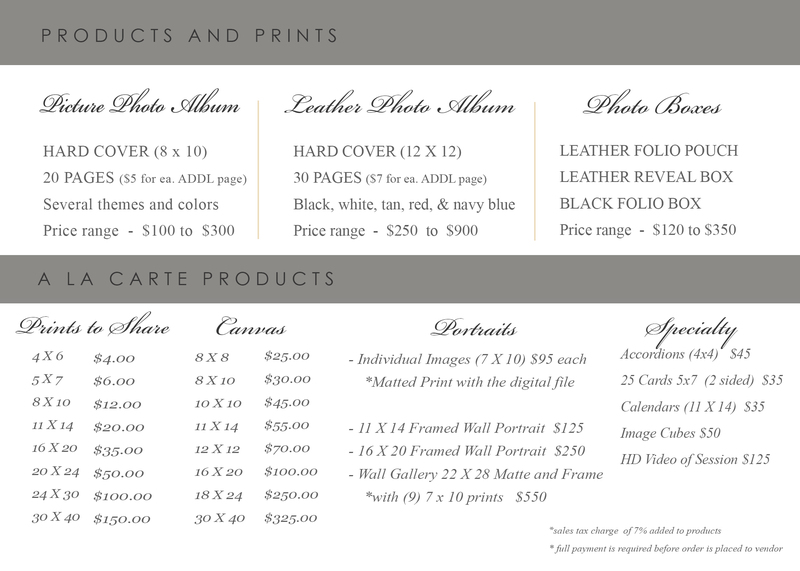 ​Price list is available upon request. For more ordering options, see the Products page. There are a variety of gift options for brides, graduates, grandparents, parents and many more. Photo albums can be customized and upgraded for that special occasion or person. Send a payment through your bill pay account to Amber Urioste - A.U. Photography. Send a payment through my secure business Square account once you receive an invoice. You will be emailed a receipt once you send your payment. Receive a 8 X 10 print from your session if you refer a friend!